I got this email for the second time. it is from the University of Illinois, claiming to do research for a thesis. It says they are approaching students in the course Emergent Phenomena , which is by UCI. A student got it for Astronomy, by the University of Arizona. Did Coursera give out everyone’s email addresses? Has anyone here had it? 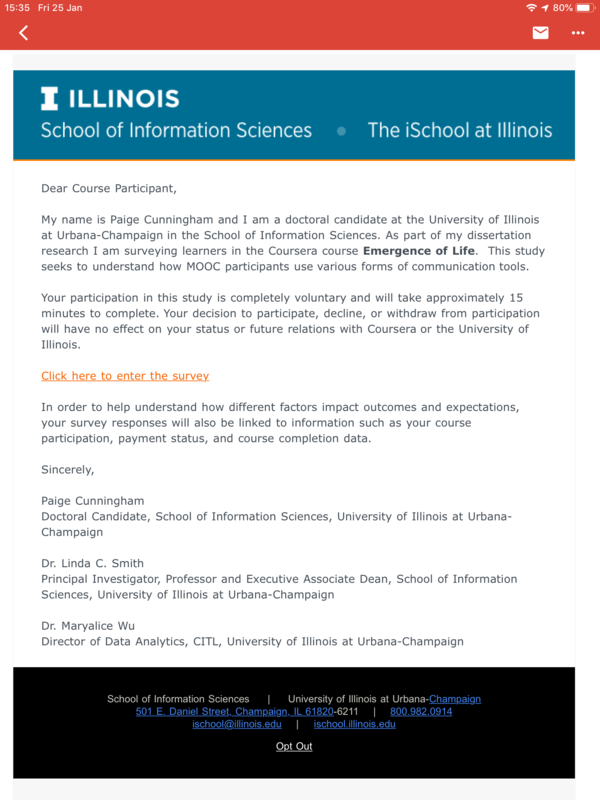 @Lochcarron Have you done any courses from the University of Illinois? If you have, chances are that there was a box somewhere that was pre-ticked, giving permission for U of I to send emails to you. You would need to un-tick the box to revoke your permission. Alternatively, you should be able to un-subscribe from these emails by selecting Opt Out at the bottom. You mentioned the course Emergent Phenomena, but the text of the email says Emergence of Life. Have you enrolled in either of these courses? Was the subject of the email perhaps input incorrectly? You could be very right, @Pat B! it is still strange that the other student got one because he is in the Astronomy course.